This photo was taken by Renato Morbach and shows a floating market in Thailand. If you have a photo you would like to see featured on the site, please email lizannday@googlemail.com, or tweet @thegreenveggie. After a delicious meal at Ezo’s Turkish Restaurant last weekend, I decided to have a go at making mousakka myself. This new take on the classic recipe uses red lentils and aubergines. In total, it takes about an hour, but it’s well worth it! Toss the aubergine slices in olive oil, then drain and season to taste. Fry the aubergine slices until golden-brown on both sides. Add the onion, pepper and garlic to the pan and fry until softened. Stir in the tomato purée and continue to fry for a further 5 minutes. Add the chopped tomatoes and cinnamon stick and simmer for 5 minutes. 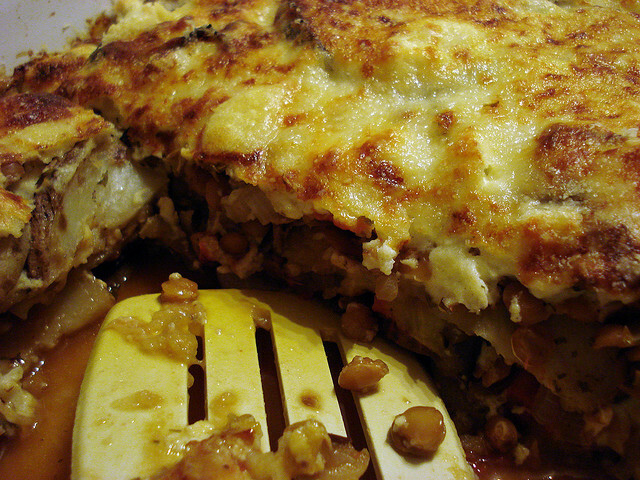 Add the lentils and fried aubergines to the mixture. Simmer until warmed through. Transfer the mixture to an ovenproof dish and sprinkle with chopped parsley. For the topping, beat together the ricotta, Greek yoghurt, eggs and grated nutmeg in a bowl. Season, to taste. Pour the topping mixture into the ovenproof dish on top of the filling. Sprinkle over the grated parmesan. Bake for 25-30 minutes, or until the topping is golden-brown. Serve immediately. This is a brilliantly simple summery dish. 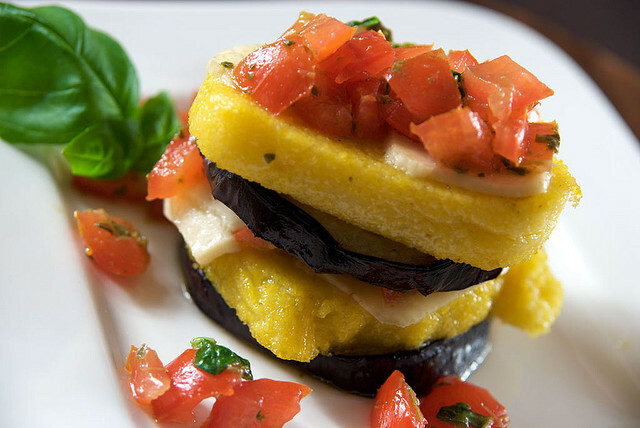 Just slice the polenta and vegetables, stick everything under the grill and voila – easy! You can even adapt this recipe to use on the barbecue for those sunny summer evenings. Cut the polenta into slices, so that each slice is about 1cm thick. Lay the polenta slices on a baking tray, then brush with olive oil and sprinkle with salt and black pepper. Put the polenta under the grill on a low heat and grill until it starts to turn golden. Turn the slices over when they start to brown. While watching the polenta, cut the vegetables and halloumi into bite-sized pieces. Toss the vegetables and halloumi in olive oil and season well. Remove the polenta from the grill and keep warm in the oven. Spread the vegetables and halloumi on a baking tray and grill until the vegetables have softened. Mix the tomatoes and pesto in a saucepan over a gentle heat and season well. Lay the warm polenta slices on to plates and arrange the vegetables and halloumi over the top. Finish by spooning over the tomato and pesto sauce and garnish with the basil leaves. Traditional Sunday lunches do not always provide ideal vegetarian fare. I always associate a Sunday roast with my grandma’s epic portions of roast beef and enough sausages to sink a small ship. 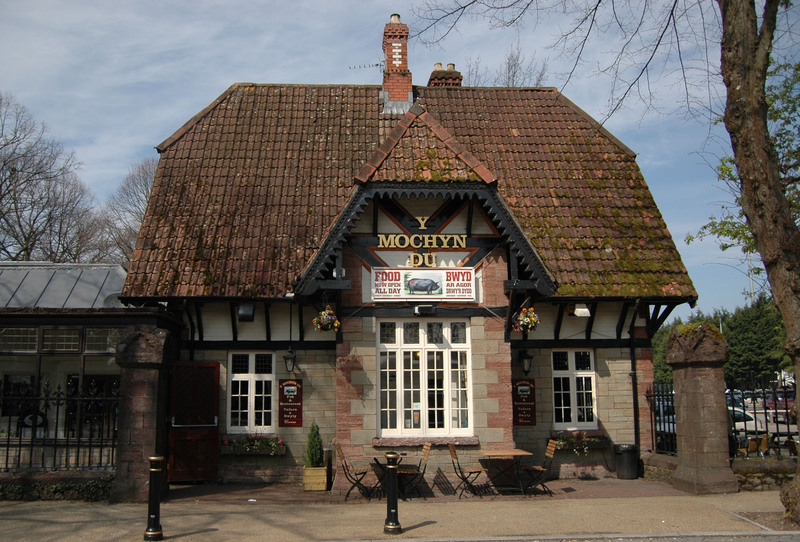 Y Mochyn Du, meaning the black pig, is a light and airy pub, right next to Bute Park in the heart of Cardiff. 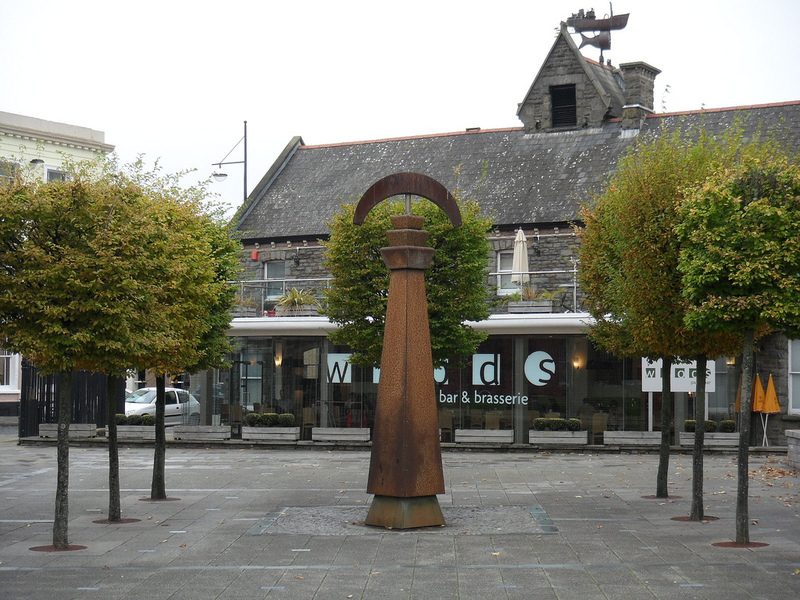 This popular drinking hole is the main meeting place for Welsh speakers in the area and you will often hear a male voice choir practicing their repertoire in the conservatory on a Saturday evening. This pub was nominated Pub of the Year in 2007, 2009 and 2010 and their slogan “for all reasons and all seasons,” aptly sums up the pleasant setting. There’s a lovely sunny beer garden, complete with patio umbrellas for glorious summer days, as well as a cosy fire and comfy sofas for chilly winter evenings. The vegetarian option was Glamorgan sausages, which was priced at £7.75. The sausages were delicious and were clearly handmade, using local Caerphilly cheese. These traditional Welsh sausages were thick, flavoursome and coated in crispy breadcrumbs. The sausages were served with a generous portion of Yorkshire pudding, fresh vegetables and golden roast potatoes. The bar also had a wide range of local ales on tap, most of which were suitable for vegetarians and vegans. A great place to meet up with friends or family. 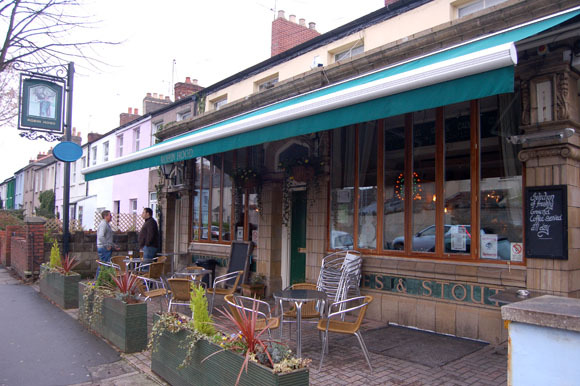 The Robin Hood is a friendly, bustling pub, tucked away in the leafy heart of Pontcanna. The shady awning and pretty window boxes give the pub a European feel and the front patio provides some excellent people watching opportunities. The Sunday lunch menu did not offer much choice, with only three or four options available and only one vegetarian dish. However, the quality of the food more than made up for the lack of choice. The vegetarian option was a generous slice of nut roast, served with a small silver jug of vegetarian gravy. The nut roast was crispy and packed full of different herb flavours. A large bowl of fresh vegetables was brought to the table for us to share. This included carrots, broccoli, parsnips and roast potatoes, which were all cooked to perfection. The pub also offers a free bottle of wine if you book a table in advance, making Sunday lunch at the Robin Hood excellent value for money. A great place to take the parents. This contemporary restaurant, situated in the pilotage building in Cardiff Bay, had a very modern feel. The glass roof and minimalist decor provided a pleasant setting, which was just as well, because the service was incredibly slow. The menu at Woods Brasserie was slightly pretentious, offering the sort of dishes where you either need a foreign phrase book, or are obliged to ask the waiter to interpret the unnecessarily elaborate and over-fussy descriptions. On the plus side, there were several vegetarian dishes to choose from. For a starter, I tried fregola with ewe’s cheese, artichokes, pine nuts and lemon. Just in case you’re wondering (I certainly was) fregola is a type of pasta, made up of small, round beads, with a couscous-like texture. Although I appreciated the originality and presentation of the dish, the execution was disappointing. The fregola and artichokes were poorly cooked, with some chewy, raw pieces spoiling the otherwise light and delicate flavours. The main course was carrot and cumin fritters with smoked baba ganoush, basil and shallot. The classic combination of carrot and cumin worked well, but the fritters were overwhelmingly oily, which made them heavy and soggy. I had never tried baba ganoush (which is made from mashed aubergine and olive oil) and based on this experience, I would not be inclined to try it again! Like the fritters, the texture was very oily, which did not help the wetness of the fritters, and overall, the main course was mushy, with a riot of conflicting flavours fighting for the attention of your taste buds. The restaurant was also more expensive than the previous two, with lunch costing £20 for three courses. However, after two disappointing courses and ridiculously slow service, we decided not to stay for a desert. A sunny walk around Cardiff Bay seemed more appealing! This photo was taken by Nick Jewell and shows a vegetable stall in Cusco, Peru. Here’s a link to more of Nick’s work. If you have a photo you would like to see featured on the site, please email thegreenveggie@gmail.com or tweet @thegreenveggie. 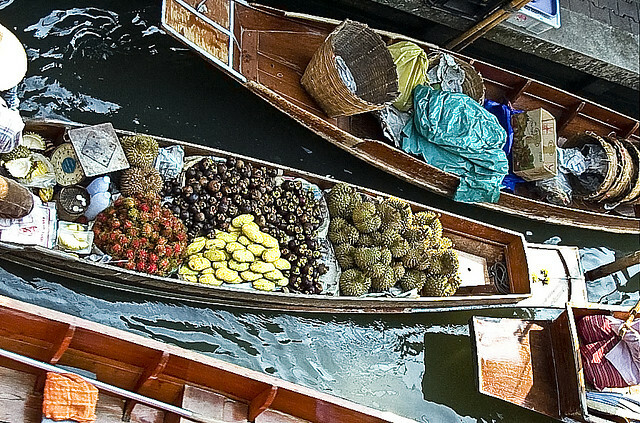 This photo was taken by Richard Parker and shows a fruit stall in the Philippines. Here’s a link to more of Richard’s work. If you have a photo you would like to see featured on the site, please email: thegreenveggie@gmail.com. Vegetarian chilli is wonderfully quick and easy to make and is packed full of healthy vegetables and pulses. I usually serve it with rice, but it’s pretty good with baked sweet potatoes too. Fry the onion and garlic together with the chilli and cumin until the onions are soft. Add the peppers, carrots and drained green lentils and cook for five minutes, stirring all the time. Add the tomatoes, purée, stock and peas, bring to the boil and simmer until the lentils are tender. Add the mushrooms and courgettes and simmer for five minutes more. Add the cooked kidney beans and simmer for five more minutes.